In a recent call with my accountability partners from a training program, we were discussing the things that we needed to accomplish for the coming weeks. I could sense that most of us were overwhelmed because we all have day jobs while trying to hone our skills to do what we love to do, which is coaching, training and developing leaders. The program is very demanding in that we have homework, numerous calls and accountability partners that challenge and push us outside our comfort zones. I myself felt that it is a bit too much, but I’m thinking to myself that if this were easy, everyone would be doing it already. If this were just plain general knowledge when it would be worth nothing. The focus really is to acquire this specialized knowledge and make ourselves marketable in the area in which we are passionate. As we discussed during the call, one participant suggested that we reduce the number of assignments. While I’m interested in the idea, I said to myself that, if we settle, we will not achieve our goal. Joining the program meant that we wanted to stretch and challenge ourselves. Two weeks into the program we were compromising and settling. I explained to the team why it is not a good idea to settle; I also encouraged them to just give it their best shot, because I’ll do the same. To achieve something in life, there will be sacrifices. It could be lack of sleep, time with love ones, relaxation time, etc. We need to weigh the value of achieving that goal. How important is that goal to us? Why does it matter that we achieve it? It is then we decide the dedication and commitment we need to get it done. Once committed, we just need to follow through and be persistent. Nothing can be accomplished when we quit too early. As I explained to my daughter, we take a light bulb for granted because it is there every day. If Thomas Edison quit after failing over a thousand times, we would be sitting in the dark with a gas lamp today. Is that prospect better? Think about it. If it is easy, everyone would be doing it and there will be no value in doing it. The key to a successful career is gaining that specialized knowledge that allows you to differentiate yourself from everyone else. Differentiation is the key and you can only achieve that by continuous learning and being focused on your goal. As Jim Rohn says, “If you are not willing to risk the unusual, you will have to settle for the ordinary.” To be ordinary, you’ll be in the middle of the pack. Is that what you aim to achieve? If that’s what you want, that is perfectly fine, but progress and dreams cannot be achieved in such a manner. As John F. Kennedy said, “Once you say you’re going to settle for second, that’s what happens to you in life.” Our mind is very powerful; when we settle, our opportunity also decreases significantly. 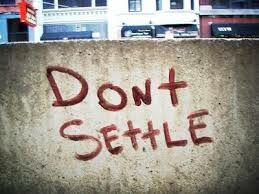 I see every day that people settle for less than they deserve. They do this because they are comfortable and just want to go with the flow. The reality is that everything around us is changing and progressing. Staying in your place is not going to help you. In my opinion, they are partially living their dream, and partial can never equate to fulfillment. I do believe that every person has potential for greatness; however, it is only possible if you push the envelope and make it happen. Writing is a labor of love. If you like my blog, please share it with your friend. If you don’t agree, share your thoughts and comments. Very nice blog Will. It definitely gave a new perspective on how I approach things in life.